Fabrizia Villa is a great property for groups or a family with older children. 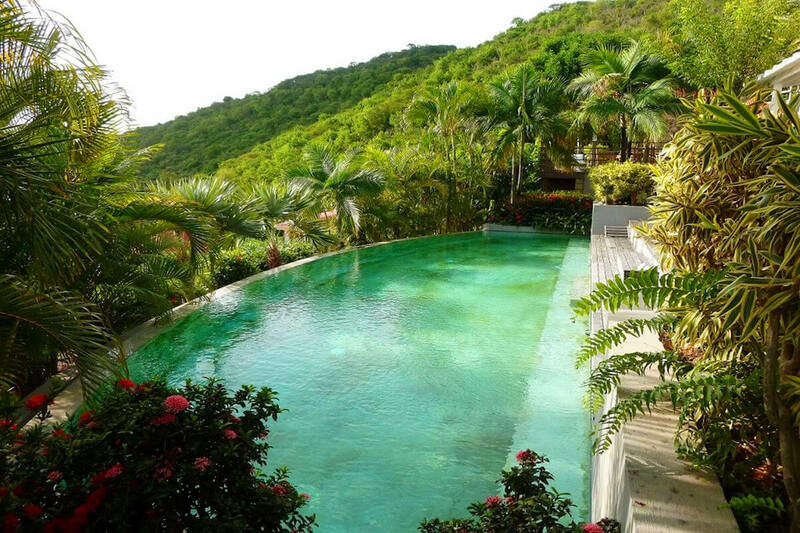 This vacation rental has 8 bedrooms, several private terraces, and an infinity pool that juts out over the hillside. It’s within walking distance of Gustavia’s Shell Beach, restaurants, and boutiques. There’s a Thai restaurant, patisserie, French bistro, Japanese sushi bar, and gourmet seafood all within a few minutes of the villa. Close to beach, restaurants and shops! Fabrizia is located on the hillside in Gustavia. The villa has a view of the harbor and St. Maarten, which glitters at sunset. The multi-leveled terrace has several loungers and a semi-circle shaped pool that looks out at the sea. The dining pavilion holds a gas BBQ, and sits next to the Jacuzzi and patio furniture. This area opens to the living room, sitting area, and dining room. Guests can watch TV in the living room on plush couches after enjoying a gourmet meal cooked in the fully equipped kitchen. The office is off to the side of the villa, where guests can work behind the desk or read a book from the library. The villa has eight bedrooms in separate areas, each with an ensuite bathroom and air-conditioning. They each enjoy views of Gustavia’s harbor, and some of the suites have al fresco showers and TVs. The master bedroom opens to a private terrace, and has a queen-sized bed. Five more bedrooms have queen-sized beds, one bedroom has a king-sized bed, and the children’s room has four bunk beds and a game area. The setup of the bedrooms make Fabrizia perfect for family reunions or retreats with friends. This location is ideal for those who want to be within walking distance to restaurants, boutiques, and Shell Beach. Shell Beach’s restaurant, Shellona, has cold drinks, salads, and sandwiches for guests to grab as they venture into the waves. Half circle pool and Jacuzzi are facing the sunset.